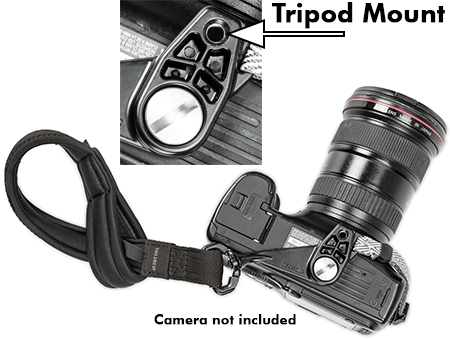 This is an anti-theft wrist strap for DSLR or mirrorless cameras. It's incredibly light, but amazingly strong. It fits any camera that has a wrist-strap loop and has a double-safety feature to help prevent from accidentally dropping your camera. It tightens to your wrist if your camera is dropped or snatched. Constructed from comfortable neoprene, the strap is slash-resistant with the addition of a heavy duty rotating camera lug and screw to secure it to your camera or attach it to a tripod. The camera mounting plate has two attachment points to help ensure optimal protection against opportunistic theft, accidental drops and makes taking photos easier while out and about. Don't let this strap fool you - it looks (and is) lightweight, but it is incredibly strong and very comfortable! Flexible, lightweight, stainless steel wire is integrated into this strap making it invisible to the eye, yet very effective at preventing bag slashers from slicing through and running off with your gear. It attaches to one of your camera's strap connectors with Dyneema® fabric to help prevent thieves from running off with your equipment. Dyneema® fabric is the strongest and most durable fiber in the world. It's 15 times stronger than steel.